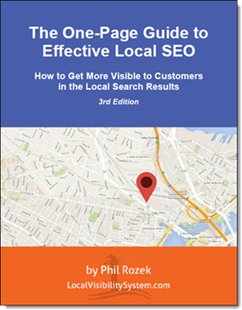 Which of your local-search competitors is most worth learning from? A lot of times I’d agree that – all other things being equal – you should probably pay more attention to the King of the Hill than to the Prince of the Pile. But what I’d really want to know is: Who’s stretching Google’s map? Dig that D-ranked lawyer. 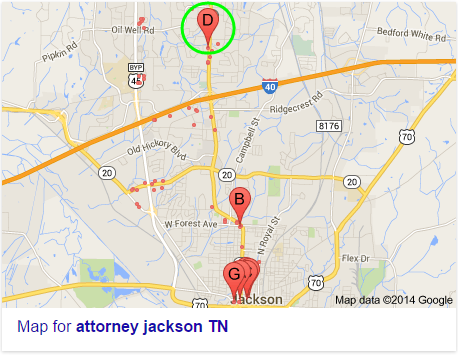 Pretty much all the other attorneys in Jackson, TN are right in the middle of town. If not for that one guy, the map would be centered on central Jackson. But he causes the whole map to pull north – by 5 1/2 miles. I’ve seen this kind of thing for years, and probably so have you. Much ink has been spilled on the “distance” topic. But yesterday a conversation in the Local U forum (worth joining, by the way) made me think about it in a new way. Ben Walsh of Baseline SEO asked a great question about the “attorney Jackson TN” example I just showed. Find out whatever D is doing – they’ve managed to drag the map which means that they’re doing something right. Turns out that the attorney who stretches that particular map isn’t doing anything extraordinary. On the one hand, he’s got clean citations, a page for every case type, a good homepage title tag, and no toxic links. But on the other hand, he’s got no Google reviews, no noteworthy links, and he doesn’t seem to be listed on many attorney-specific sites. But being solid on the fundamentals is usually all you need to rank pretty well – if not to stretch the map. 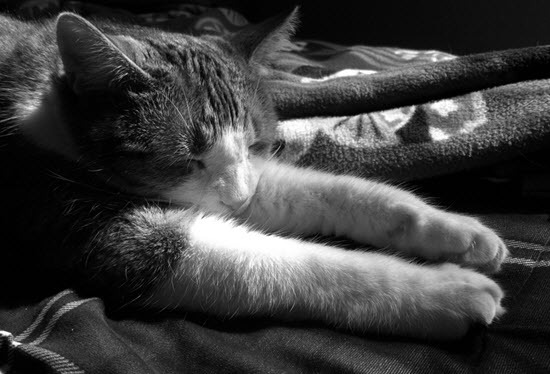 I’ve had clients in that nice position, and I’ve had clients up against stretchy competitors. Pay attention to businesses that stretch the map (in your market and in others). They’re easy enough to spot.